Traditional Spanish food and in particular Andalucian food hails from the region of Southern Spain and it has been influenced by a multitude of flavours, from North African to Moors, Christians, Jews, and Romans. 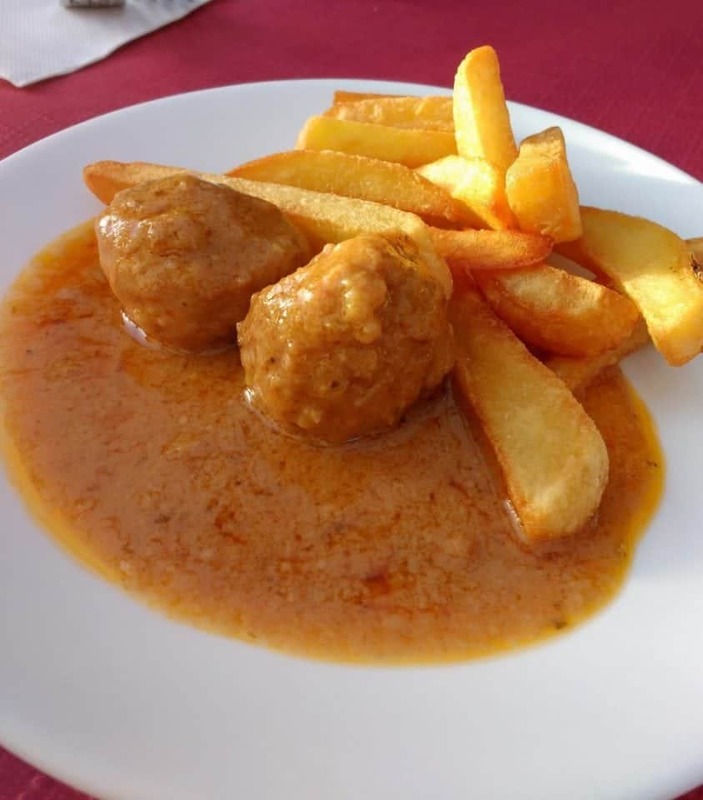 Regional Andalusian food favourites include; gazpacho, gambas (shrimp) right at the waters edge, octopus, paellas, almorejo (an almond soup) and a host of other delicacies. Andalucía is best known for its beaches, sunny weather and flamenco and tourists flock to Andalusia for the sun and vacation vibes. Food plays a hugely important part in that Spanish culture and eating out is a big part of that. Spanish food is so reasonably priced in Andalucía, and tapas is the preferred way to spend an evening. 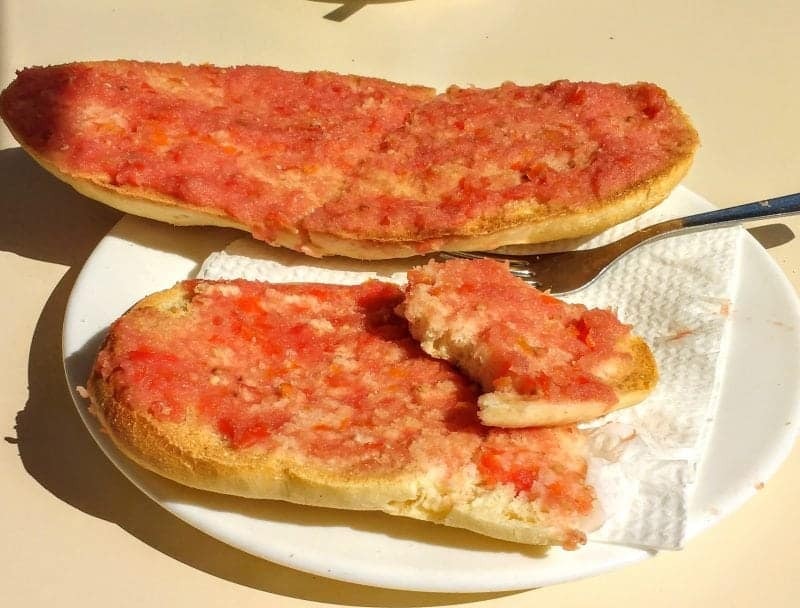 Most villages and town in this part of Spain still include either a free tapa with a drink or a tapear can be ordered for a minimum of €1 euro each. Eating tapa by the ocean is a beautiful way to spend the day so head to your nearest chiringuito – beach-side restaurant, and enjoy some tapa. The history of Andalucía is all within the food served here. A strongly agricultural region Andalusia is deeply influenced by the land and the sea. Most of us have heard of tapas but Andalusian food is so much more than that. 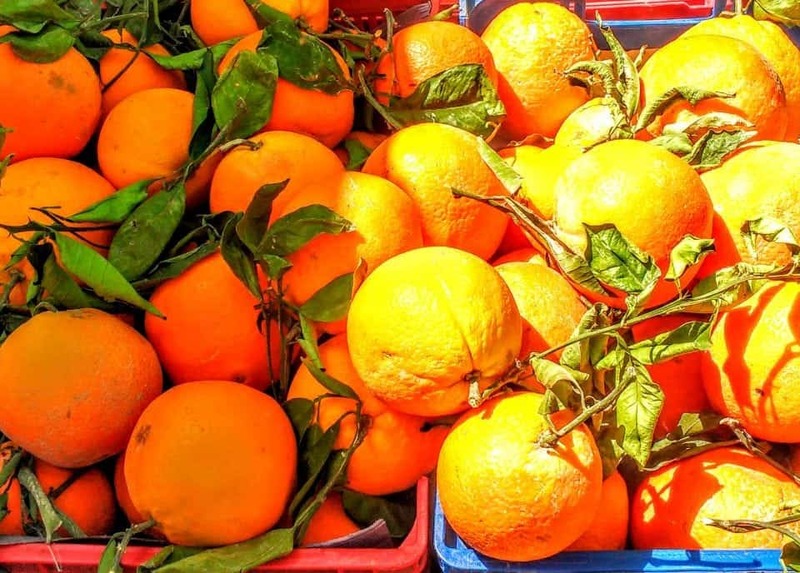 The region allows for the harvesting of 5 plantings of most fruit and veg per year, this means that strawberries, eggplant, artichokes, tomatoes, leeks, and a cornucopia of fruit and veg are available year round. There is also the incredible healthy olives and olive oils, Iberico and Serrano Jamon, almonds, and seafood not seen in Canada and the U.S.A.
Want to learn more about Spanish Olive Oil and perhaps take a tour of an Olive Oil Mill? One fine day King Alfonso XIII was visiting various parts of his kingdom and he stopped in Cadiz at the Ventorrillo del Chato. A very strong wind meant that the sand and dust was blowing into his drink of sherry. An enterprising waiter covered the Kings sherry with a slice of Jamon. 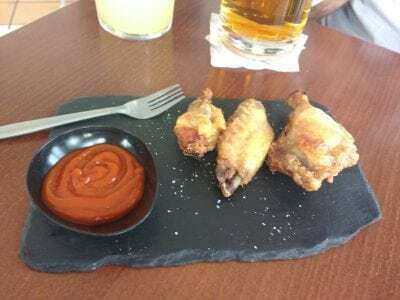 The King asked why and the waiter explained his actions and the King then ordered his next drink with this cover of topping or ‘tapear’ which is where the name tapa comes from. To this day the art of tapa or little toppings of food has become an art, particularly in the Andalucia region. 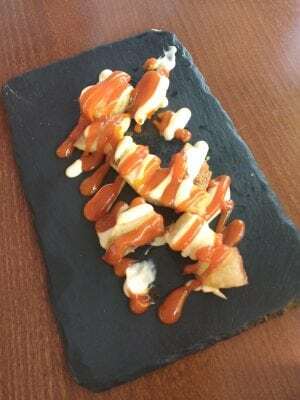 What is the difference between a Pincho, Tapa and Raciones? 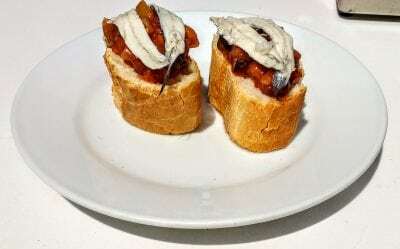 In the Basque country, they serve pinchos or pinxtos which comes from the Spanish verb ‘pinchar’, which means ‘to pierce’. The main difference between pinchos and tapas is that pinchos uses toothpicks to keep the food on top of the bread. If you are eating pinchos you must save your toothpick as this is how the waiter calculates your tab. Similar to ordering Chinese food raciones are simply larger portions of the single tapas. 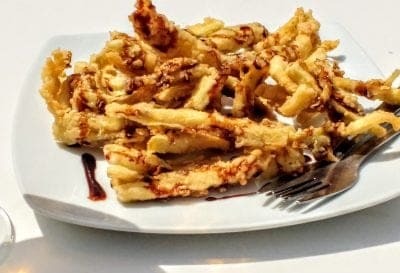 It could be a plate of grilled sardines or anchovies, a platter of honey drizzled eggplant or some deep fried squid rings. There is quite a bit of variation within the cuisine but some dishes remain classics. Usually, every restaurant will serve a Menu del Dia which simply means Menu of the Day and will include 3 courses. 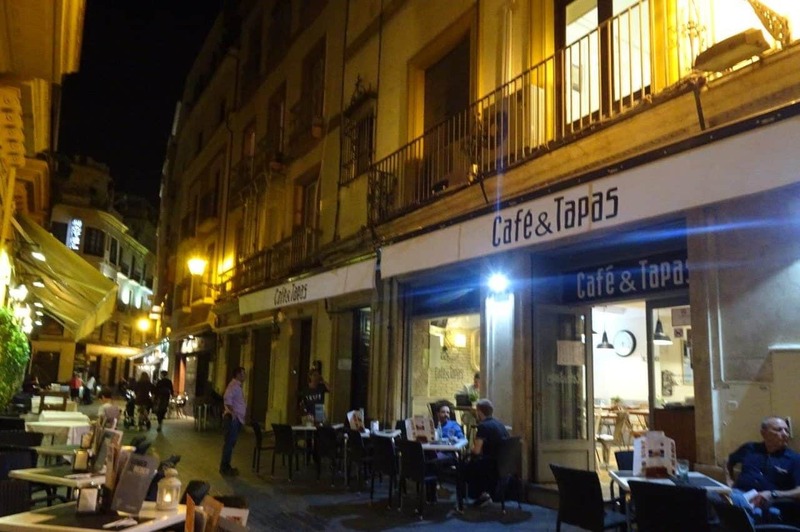 The majority of restaurants will also serve tapas when you order an alcoholic based drink, for every drink you may get one free tapas or in some cases you can order different tapas for around €1-2 per tapa. 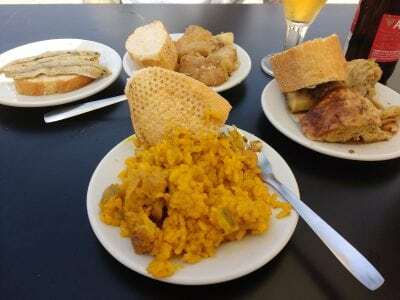 It can be a bit confusing if you are new to the area but the Spanish have a very different way of eating throughout the day with their heaviest meal at what we consider lunchtime. Here is how a typical Andalusian day would go. Unlike our heavier North American or United Kingdom style breakfasts the Spanish tend to prefer a much lighter fare and a sweeter one. The Spanish love a freshly squeezed orange juice (Naranja) and coffee for breakfast. 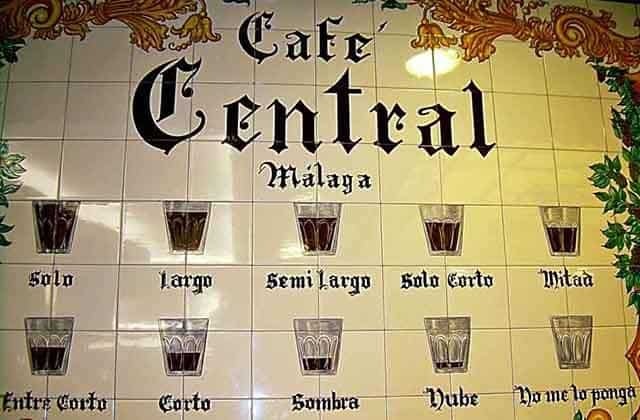 Coffee in Andalusia is quite different than coffee elsewhere in Spain there are very distinct differences particularly in the Malaga area as the photo demonstrates. Café Solo is a strong, black espresso. Café Americano basically a shot of espresso with hot water to give a milder cup of coffee. Café con Hielo an espresso served with a glass of ice to pour the coffee over. Café con Leche is equal parts steamed milk and espresso. Similar to the doughnut and coffee breakfast in N.A the Spanish like their churros crispy and served with a sweet hot chocolate drink that tastes like a melted milk chocolate bar. Delicious when you dip your churro into your chocolate or simply sprinkle sugar on the churro and dip into your Cafe con leche. A tostada is simply a toasted bun or pitufo that has been drizzled with olive oil, the bun is then topped with pureed fresh tomato and if you want you can add queso (cheese) or Jamon (ham). You can order a media which is a half order or a full order. The pitufo is an oblong shaped thin crusty roll that is around 7-8 inches in length. from 11 am until around noon the Spanish take a break to hold them over until dinner. 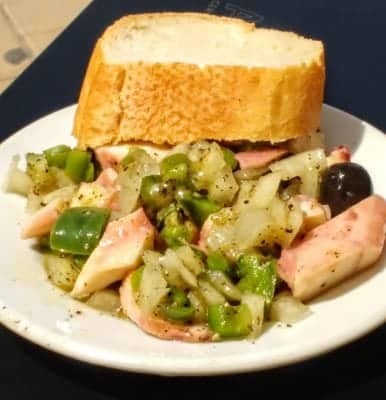 This is usually a snack of a small sandwich or bocadillo but you have to save your appetite for lunch that is the Spanish main meal of the day. Lunch usually takes place from around 2 pm until 4 pm and don’t forget many Spanish areas still have a siesta from 2-5pm. This is the main meal of the day, so keep your eyes out for the menú del día or set menu. 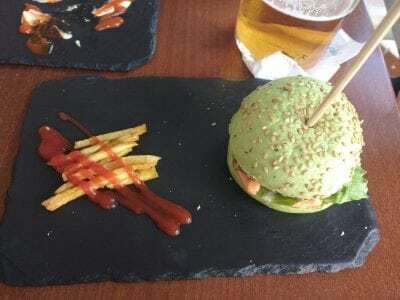 These are generally a set price from around 8 Euros and up and include a soup or salad, bread, the main meal of fish or meat, a beverage, then coffee and dessert. 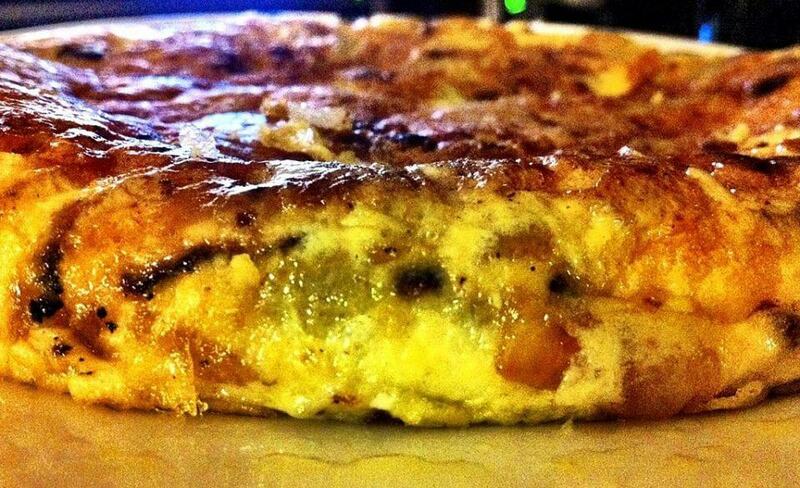 One of the Spanish lunch favourites is the Spanish tortilla, served warm or cold as tapa it is as far removed from a Mexican tortilla as you can get. Essentially it is like a quiche but the base is fried potatoes with an egg mixture on top. The mixture can have chorizo or manchego cheese added and it makes the perfect light lunch. 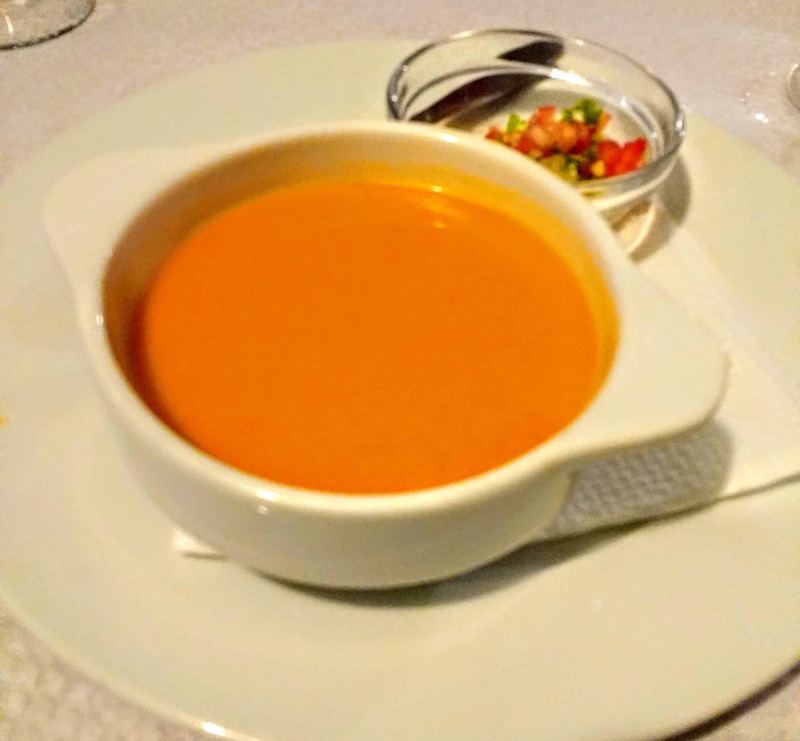 I have to say a word or more here about Andalusian cold soups – can I just say from a die-hard fan of hot soup I debated trying the Spanish soups but they are simply amazing. Fresh, light, filled with flavour a wonderful taste treat that you should try immediately. Andalucia’s trademark food is a cold soup or liquid salad made with fresh, raw vegetables. Gazpacho Andalucia, in one form or dates back as far as the country itself. It probably derives from a Roman dish, a sort of gruel of bread and oil. 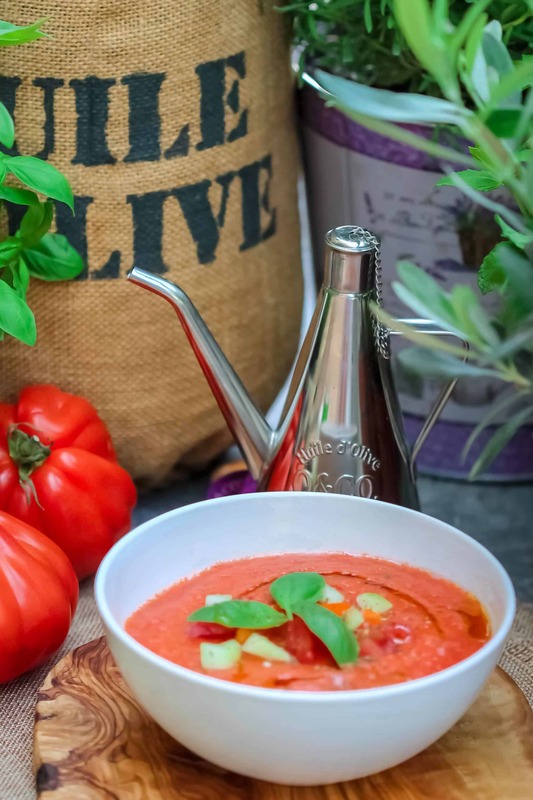 The name gazpacho may come from the Latin Caspa, meaning fragments or little pieces, referring to the breadcrumbs which are such an essential ingredient. 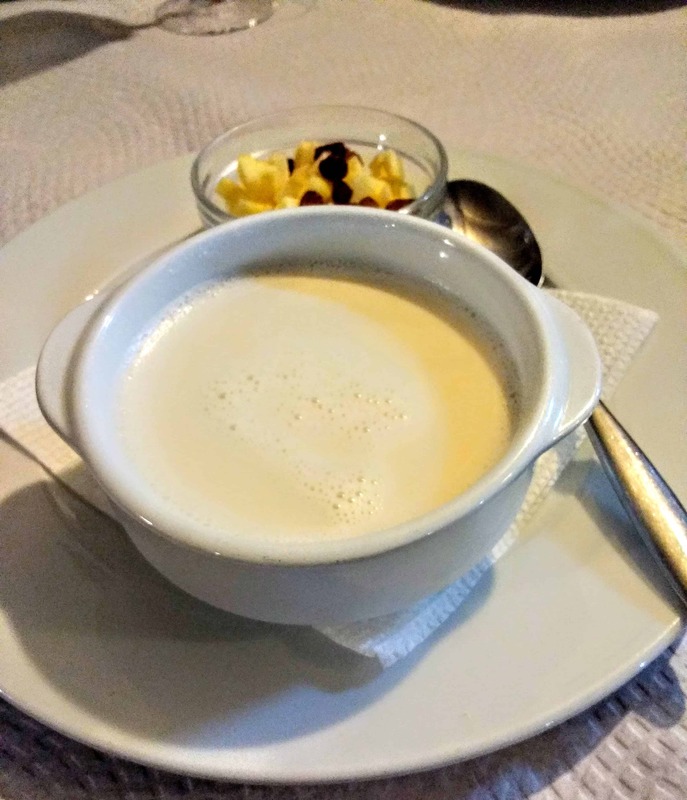 The Moorish influence is evident too, especially in some of the variations on the basic theme, such as Ajo Blanco, made with ground almonds. Of course, none of those forerunners of gazpacho contained tomatoes, considered basic today. That’s because tomatoes were unknown in Spain, until after the discovery of the New World. Gazpacho belongs especially to Andalusia, southern Spain. Here day labourers working in vineyards, olive plantations, citrus groves, wheat fields or cork forests were given rations of bread and oil for their meals. Bread soaked in water made a simple soup, to which was added oil, garlic and salt for flavour, plus whatever fresh vegetables were available–tomatoes, peppers and cucumbers in the summer. Everything was pounded together in a mortar or dornillo, a large wooden bowl. 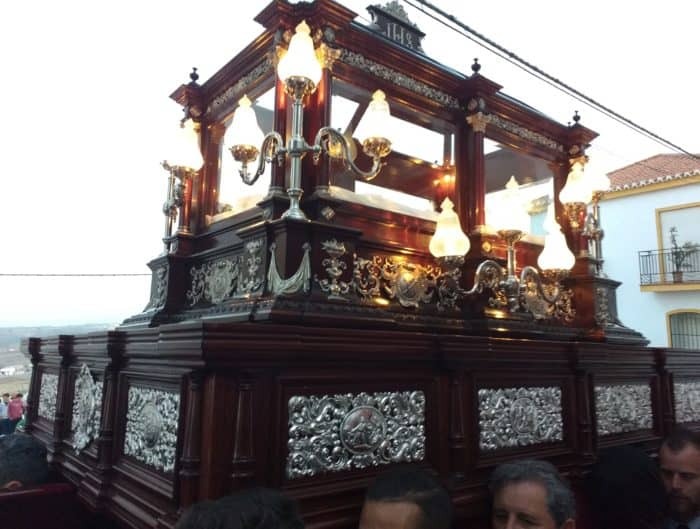 Gazpacho provided nourishment quenched the thirst and sustained a body working in the hot sun. Andalusian Salmorejo is a cold, creamy tomato soup, originating in Córdoba, Spain and is Gazpacho’s “cousin.” Made with tomatoes, bread, oil, garlic and vinegar, it is a beautiful deep pink-orange, summer soup that is sure to refresh. Garnish with diced Serrano or Iberico ham and hard-boiled eggs. Cold white garlic soup or “Sopa de Ajo Blanco” is zesty, but very refreshing. It is easy, quick and healthy. Although very creamy, it contains no dairy! Almonds give this soup its creamy white texture and colour. It is served with diced apple and raisins on the side which adds a hint of sweet freshness to the soup. Unlike North Americans or the Brits dinner is not served in Spain until quite late. From 5-7pm is the time is when people go out for their paseo or afternoon stroll around town, and also when folks stop for some people watching and a cold beverage or coffee. Dinner or La Cena usually takes place from 9pm-midnight. This is a much lighter version of lunch with a set menu as well. 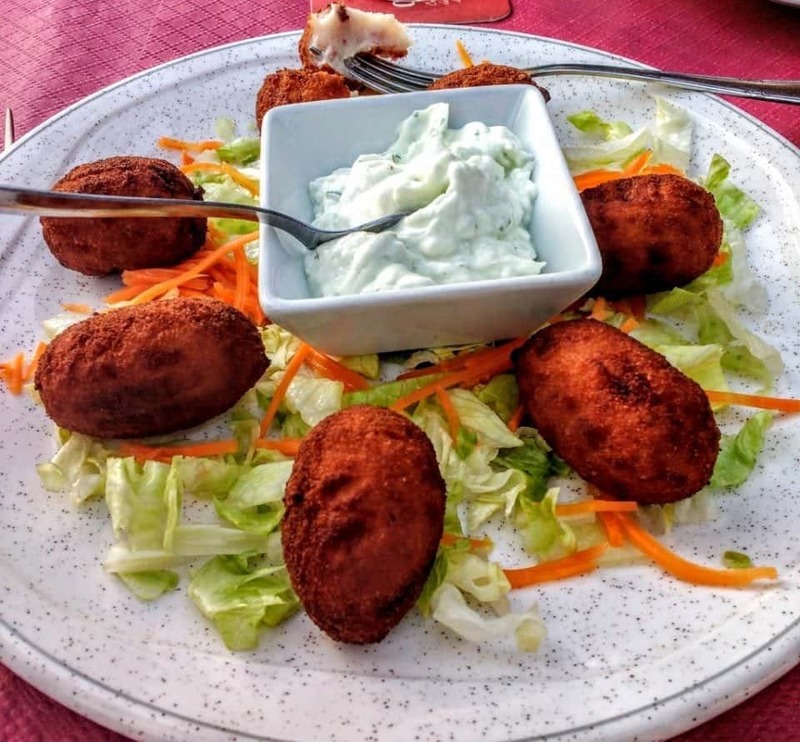 Many Spanish however simply go out for raciones or larger versions of Tapas. 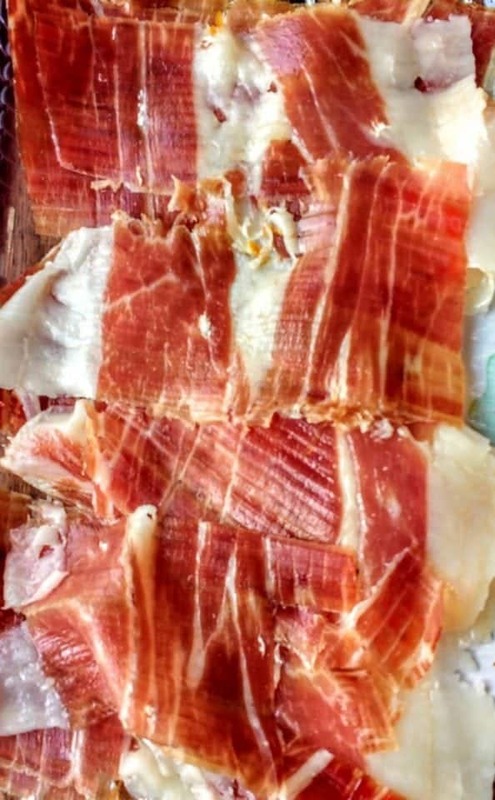 There are four classifications of Jamón Ibérico, made from the Ibérico breed pig. The classifications reflect the breed of pig, the per cent of pure Ibérico genetics in the pig and the quantity of acorns they eat (the word “acorns” is translated as “bellota”). Ibérico de Bellota hams are from Ibérico pigs that are essentially free range and live outdoors most of their lives. In the last three months before they are butchered, they spend their time feasting on the acorns in the region of Dehesa. The ham is then cured and left to age for up to 4 years. 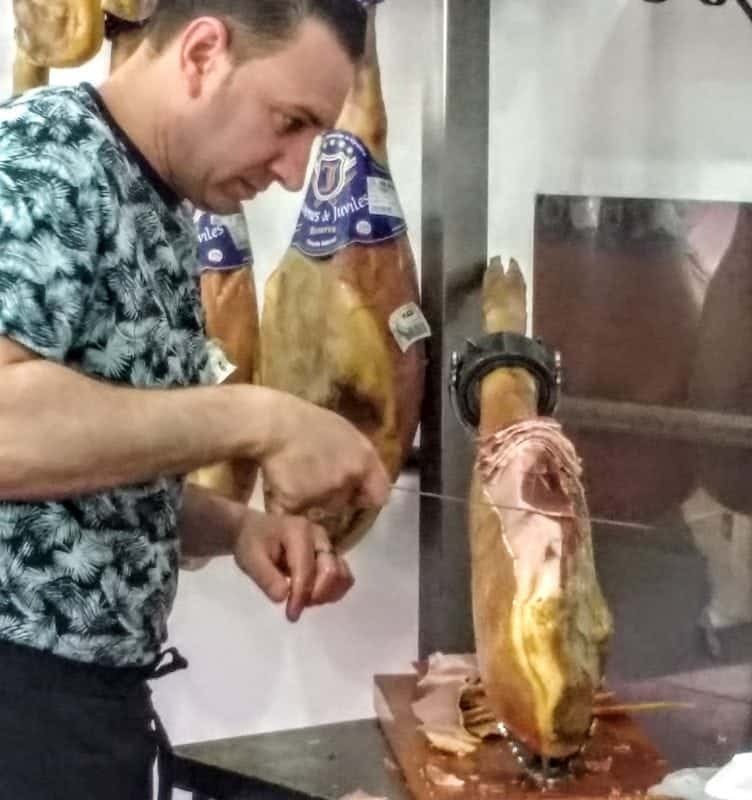 Jamón Serrano comes from white pigs of the Duroc or Landrace breeds. These pigs are raised on farms, rather than open ranges, and fed a diet of cereals. They are cured in Spain for 8 months to two years. 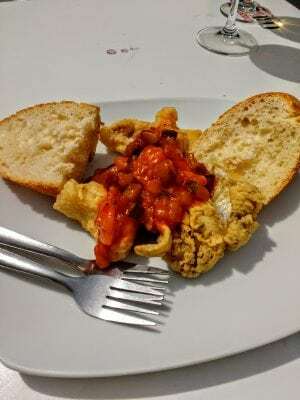 Tapa is generally speaking small plates of a variety of appetizers (served all over Spain but highly praised here in Andalusia) that can be ordered direct from the menu in some restaurants or Tapas Bars these usually come at a cost of one Euro or so. Some places offer a small selection of 4 or 5 tapas that are free with a drink. 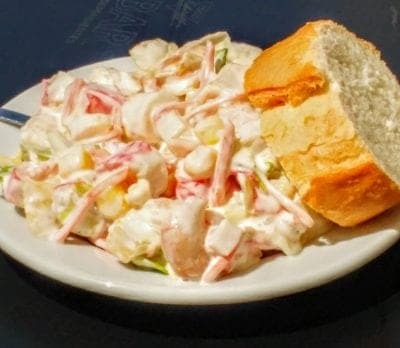 Russian salad is one of the favourite tapas here and it is a simple potato salad with tuna, corn and hardboiled egg mixed with mayonnaise. Another top favourite is croquette which is chopped ham and meat in a bechamel sauce which is then dipped in breadcrumbs and deep fried. 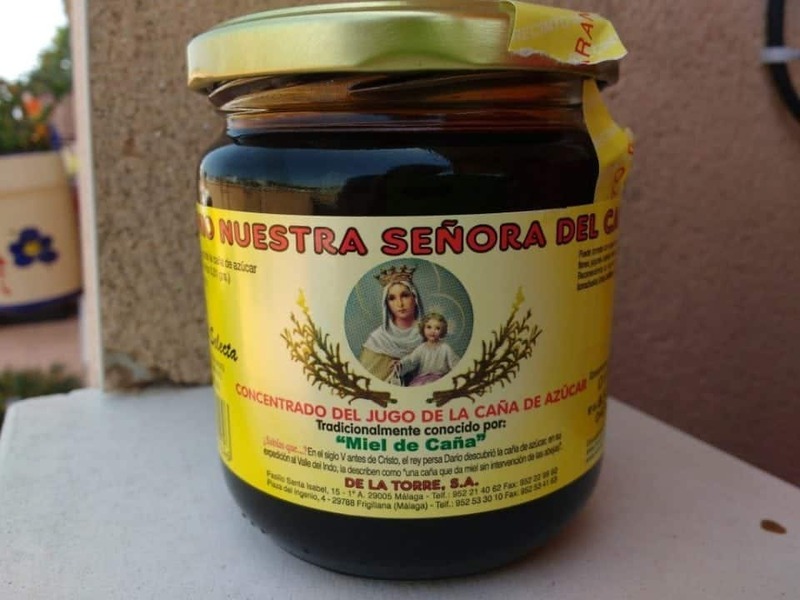 Originally introduced to Spain by the Moors Miel de Caña is honey or molasses derived from sugar cane which is only grown in the Andalucia region. The list is endless. The meatball tapas are also worth mentioning as well as the lean meat with tomatoes, anchovies in vinegar or the piquillo peppers. You will also find rabbit stew and savoury pork dishes on a tapas menu along with tripe, salted cod or bacaloa and more. It is an immense world to discover that you cannot miss if you visit Spain. Andalucia, the birthplace of this special cuisine, is the place for you to try to “go out for tapas”. If you are a total cheesehead like me you will have experienced the Spanish delight called Manchego cheese, with although it is made in the Western part of Spain, it is celebrated all over the country. Manchego is an unpasteurized sheep’s cheese that comes in several forms from soft cheese to a hard cured wheel. You can read all about Alison’s trip to a fantastic cheese festival in Trujillo, on her blog Up&AtEm Travel. Trujillo is in the Western part of Spain if you feel like travelling further afield. 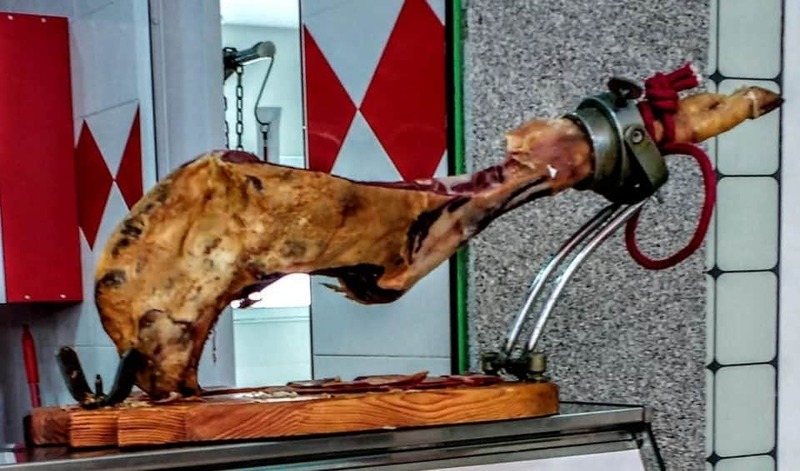 If you really want to explore Andalusian Cuisine then you need to look into some of the awesome food tours that are available. 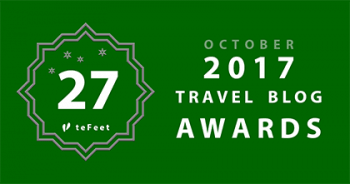 This information is taken from their websites and a fantastic way to really experience the food of this region with experts. 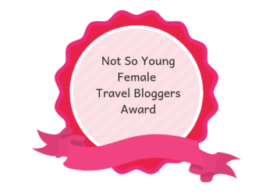 In 2012 I embarked on the biggest challenge of my life thus far. I started a small food tour company called Madrid Food Tour. Starting a business in Spain wasn’t easy, and I’m proud to say that my company has grown to become Devour Tours. We currently offer food, wine and tapas tours in Madrid, Barcelona, Seville, Malaga, Granada, and Santiago. 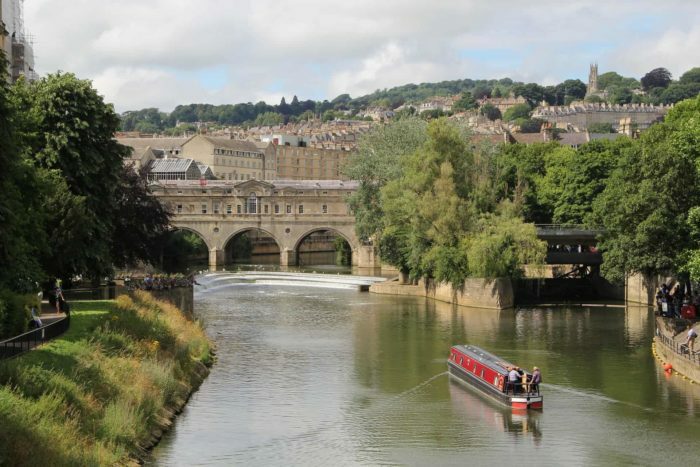 Our mission is to connect travellers to small, family-run food businesses and show them the depth of local culture. We give our guests an insider’s view of the city, complete with the story of what we’re eating and why. The journey has been both exhilarating and exhausting. If you’re visiting Spain we’d love to have you join us! We specialize in organizing private culinary tours and activities across Spain for foodie travellers and food professionals willing to experience the authentic taste of Spain. 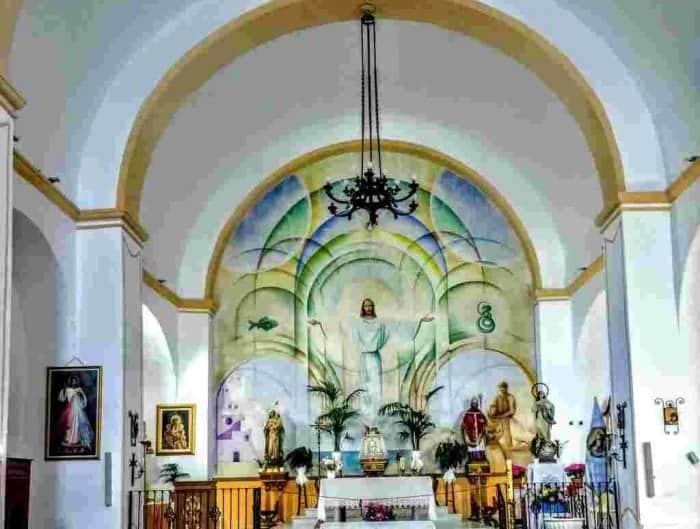 A Taste of Spain is a boutique travel agency run by a team of Spaniards with extensive experience in promoting the gastronomy and gourmet foods from Spain. We love sharing our knowledge, contacts and passion for the culinary culture of our country, providing personalized service to grant that each client enjoys the true flavours of Spain at his own pace. That octopus photo is incredible! 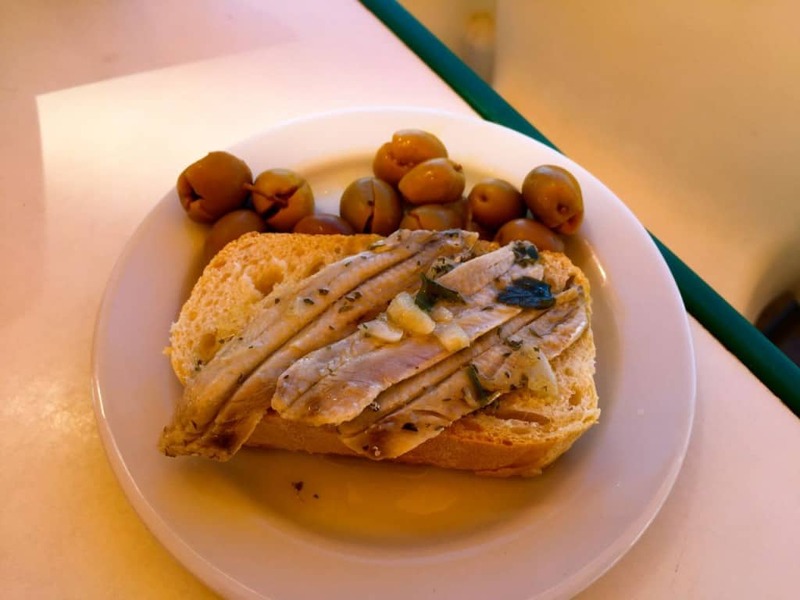 We love taking food tours and have done one in Madrid and one in Barcelona. It’s amazing how much the food can vary by region. I totally agree with you a good food tour is worth its weight in food…lol.. Interesting, in Puerto Rico, pinchos are like kebabs but mostly just meat of any kind. This may call for a food exploration trip to Puerto Rico..